The name Salo is French slang for ‘dirty and a little uncouth in a strangely good way, like mud pies’…at least that is the interpretation I received from one of the winemakers, Dave Mackintosh. This wine is a side project for Mr Mackintosh and his other winemaking mate, Steve Flamsteed. 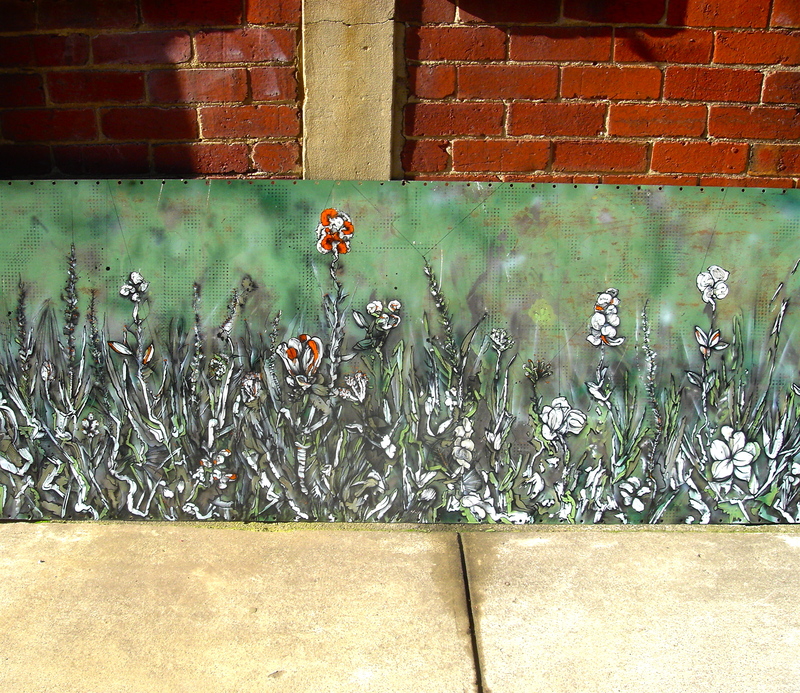 The image adorning the front label is a segment of a two metre long artwork by Greg Burton titled ‘Augment‘. His work shows light and shade, is dark but uplifting, and is made from metal that was first allowed to rust up, before being sanded and ground back, and then painted with indian ink and enamel. This gritty, textured style of art coincidentally typifies the Salo wine as a rough diamond; pretty but flawed. The white winemaking method involved testing a few boundaries. The grapes were fermented with 20% whole bunches and spent an unconventional seven days on skins with a few pump-overs before being transferred and finished off in barrel. The end result is a widely aromatic wine with notes of lemon sherbert, candied clementine, white nectarine and crunchy brown pear. The palate is fleshy with nectarine flavours yet holds a tight acid line with wonderful mid-palate creaminess, delicate flinty characters, a lingering touch of brass and golden wattle, all completed with a fine level of phenolic texture. There are no rules for the Salo lads. In some years they might use wild ferments, some malolactic fermentation and even large format oak. The whole point of this side project is to experiment as they please. In this case, my own experiment proved that beautiful art can indeed lead you to a beautiful wine. Stockists: The 2011 is the latest release with only 130 dozen available. Try Blackhearts & Sparrows, Rathdowne Cellars, City Wine Shop, Seddon Wine Store and the Prince Wine Store. I first heard about Valentini from a Sydney gentleman who follows my blog and who waxed lyrical about these wines made in the central Abruzzo region of Italy. Admittedly the story of the late vigneron and winemaker, Edoardo Valentini, had me wanting to purchase the wine before I had even seen the label which, with its simple yet intricate sketch of the man with his grapes, only further encouraged me to try this special wine. Mr Valentini was making wine for sale from the 1956 vintage until his death in 2006 at age 72. He was renowned as Abruzzo’s best winemaker, often selling 95% of his grape yields anonymously to concentrate on the best 5% from his vineyard. Described as a secretive and hermetic artisan, he rarely disclosed his methods of viticulture and winemaking. Edoardo’s legacy continues under the guidance of his son Francesco. I shared this bottle with a close friend over a range of exquisite dishes from Sosta Cucina in North Melbourne. We waited with baited breath as the owner, Maurice, poured the deep golden yellow wine into our glass. Forgive me as I might go a little over the top in descriptors, but this was the most giving white wine I have tried in a very long time. It had full, complex aromas and flavours of aniseed, golden wattle, white marble, fatty bresaola, sourdough and brass. Doing a little additional research out of curiosity, I later discover that the wine is fermented in glass-lined cement tanks followed by ageing in large, neutral, Slavonian oak barrels. For a white wine from 2008, it had the most incredible freshness, was extremely elegant on the palate and totally focussed. My friend and I were pleasantly surprised and we could now justify why the wine is so famous. If you had to compare it to another style of wine, you could say it is like an opulent Verdicchio dei Castelli di Jesi from Le Marche in Italy, or even a rich Meursault from Burgundy in France. Valentini was an amazing wine to experience and would be well-suited to fatty charcuterie, seafood dishes or for pure enjoyment with a wonderful friend. I cannot say it was the twisting eel that caught my eye on this Pinga wine. In fact, I did not even notice the finer detailing until I had brought it home. The minimalist design on the exquisite label simply stood out against a clash of garish labels alongside it. Pinga is a pet project of Dominic and Krystina Morris, a young couple based in Bendigo where they champion their main Pondalowie label. I am going to try an analogy here and say that the twisting eel represents the blend in this wine. The Pinga takes the tempranillo grape and twists it with a splash of cabernet sauvignon, petite syrah and shiraz to add depth, flavour, colour and freshness. It is a lovely thick, black purple hue in the glass with aromas of blood plum, spice, blackberry, licorice and violets. A generous swill leaves your mouth filled with fine, silt-like tannins, followed by a thick blackberry and olive flavour that finishes with medium length. It acts as the perfect sort of wine for simple antipasto dishes or spicy meats.